Approximately 600 people opted to celebrate the holidays by taking part in activities at the Melrose Public Library on Friday, Nov. 27. 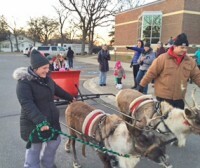 The Melrose library participated in the city wide annual Holiday Kick-Off. Library visitors were able to enjoy reindeer rides from Hemker Zoo, craft activities, temporary tattoos, cider and cookies and holiday music provided by Bob Niehaus, who has a special knack for entertaining children. The library received many positive comments on the creative crafts and what a wonderful and fun event it was. "Thanks to all of our staff for all their preparation in helping to make this a great event," said Library Services Coordinator Jan Atkinson. "It was a very special day to remember at the library!"